Friesland, one of the northern counties of Holland, is known for it's stubborn honest, unbendable population. The Wehrmacht confiscated a lot of busses there. Most where never found back. Mr. M. de Boer from Balk, owner of bus company "Zuid-West-Hoek", or short "ZWH" found a way to keep his bus. It was disassembled. The chassis simple hung on a wall of his garage, which was used for a time by the Luftwaffe. It was camouflaged, and they never suspected anything. Coach builder Hainje of nearby Heerenveen hid the finished body parts miraculously from German eyes. 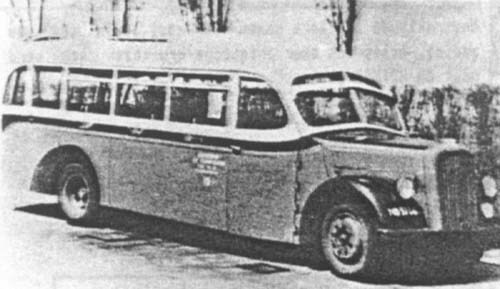 After the liberation, the Blitz bus was assembled in record time to help solve the transportation problem.